Here at World Express Travel, we offer travel services for people looking to book a trip to Israel. If you are on the fence about traveling to Israel, you should consider all of the amazing cultural, geographical, and culinary experiences you can enjoy in this wonderful country. We have already touched on great restaurants, religious sites, and outdoor activities to experience. 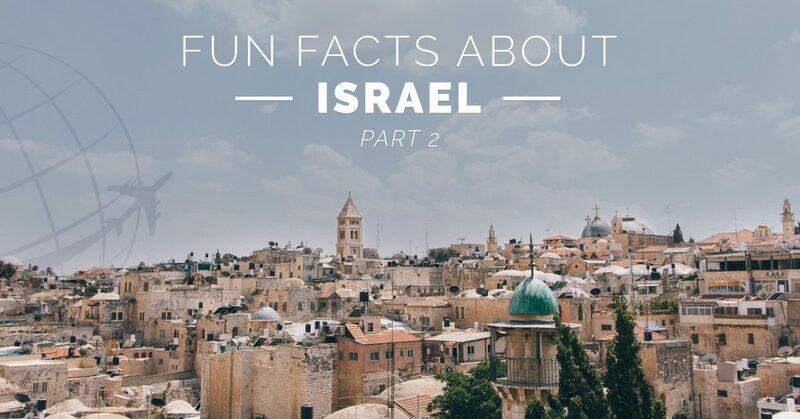 Here, we would just like to present some fun facts about Israel for you to enjoy. Though Israel only has 273 kilometers of coastline, not much by a country’s standards, it boasts 137 official beaches. So make sure to catch some sun between excursions on your trip! In Tel Aviv, there is a famous roller blade party that takes place every Tuesday night. About 300 or so participants attend at each event. Here is some video footage of them roller blading through the city streets. Israel boasts one of the highest ratios of citizens with college degrees to total population in the world. In fact, by some metrics they have the highest ratio. Although they are often competing with Canada for that distinguished title. Israel is a country that has two official languages. These are Hebrew and Arabic. For all of you English speakers worried about booking a trip to a foreign language speaking country, fret not! Almost everybody in Israel speaks English as a second language. That is quite an impressive linguistic mastery! In the 21st century, there were only two countries in the world who reported a net gain in their number of trees. Israel was one of them. Planting trees is an ancient Jewish tradition. Afforestation is a major campaign for the Jewish National Front (JNF), who have planted over 240 million trees in the country. This may seem unusual to US citizens, but Israel has no codified constitution. It is actually one of only three democracies in the world without one, the other two being New Zealand and Britain. Don’t worry, all three countries enjoy almost exactly the same freedoms you do! The OECD studies countries to determine, among other things, their average life expectancy. Israel scored very high on life expectancy at birth, with an average of 82 years. This is a full two years more than the worldwide OECD average. There are two world famous bird watching sites in Israel. These are the Eilat and the Hula Valley Reserve. These are crucial spots in many bird species’ migrating patterns, and you can have a chance to view birds you’ll likely never see anywhere else! Check out bird watching information about Israel here. Hopefully these fun facts proved interesting. If you are looking for travel services to help you book your trip to Israel, please give World Travel Express a call! We will be happy to work with you until we’ve planned the perfect vacation! For more information, please reach out to us at your earliest convenience. One of our friendly representatives will be happy to answer any questions that you may have.